I couldn’t believe the deal I found on this BMW. It had been sitting in a basement for several years. Motor was stuck and it was missing the ignition (and a few other odds and ends). I couldn’t resist towing it home. The bike is more or less in great condition. The chrome is good, the paint is reasonable. It even has Boranni wheels and Koni shocks. These old airheads are very desireable today, mostly by people who want to ride them. 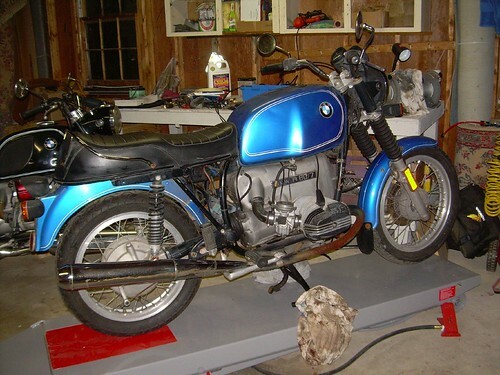 The BMW /2 and /5 bikes tend to frequently end up in 10 point restoration museums or private collections. These R80’s are generally still purchased for nice reliable transportation.